STA. 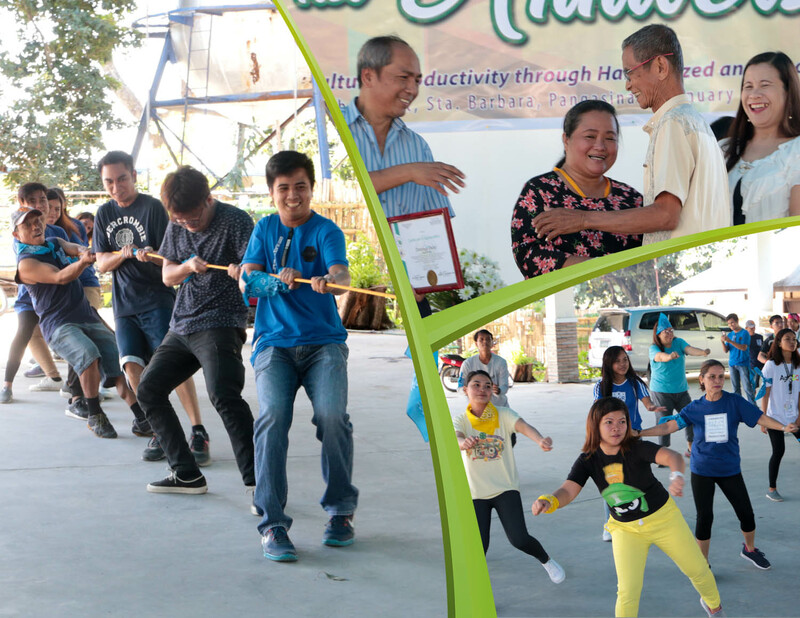 BARBARA, Pangasinan - The 32nd Anniversary of the Agricultural Training Institute marked the history of the Institute for this was the first time that Regional Training Centers (RTCs) held celebrations in their respective regions and centers. This event took place simultaneously at the RTCs on January 28-29, 2019 with the theme, “Sustaining Vibrant Agricultural Productivity through Harmonized and Proactive Extension Services”. Hence, the ATI-RTC 1 embraced the two-day event through back-to-back activities that included the “Laro ng Lahi” and the “Sambayanang Itinataguyod Kaalamang Agrikultura and Pangisdaan (SIKAP) Awards” which both aimed at exercising and displaying harmony between and among the key players in extension service. Laro ng Lahi. This was a competition played by the ATI-RTC 1 staff who were grouped into three, namely: 1) Pink Team, 2) Blue Team and 3) Yellow Team. Each of the team had a leader and an equal number of members. Games played include sack race, tug of war, patintero, luksong tinik, pukpok palayok, limbo rock, tumbang preso, and jumping rope. This highlight of the anniversary was conceptualized and facilitated by the Information Service Section (ISS), spearheaded by Ms. Maricel Dacapias. The “Laro ng Lahi” was not only a reminder how beautiful the Filipino Culture is, but it was as well an effective tool in enhancing teamwork and enriching camaraderie between players. Players expressed that their experiences as they struggle to win the games were so much alike in getting their jobs done. They, in general, mentioned that the key ingredients in order to succeed and accomplish work are communication, cooperation and teamwork. As the day ended, the yellow team was declared the champion. SIKAP Awards. This awarding aimed to recognize partners in the effective delivery of agriculture and fisheries extension services in the region, specifically for 2018. These partners are the selected members of the Rural-Based Organizations and 4H Clubs; leaders and members of the Samahang Itinataguyod ang Kaunlaran ng Agri-tursimo ng Rehiyon 1 or the 1 SIKAT; and the ATI-RTC 1 Technical and Administrative Support Staff or the so-called Job Orders. The awarding commenced through a mass officiated by Father Jovino “Bovitz” Batecan, one of managers of ATI learning sites, named Bio-Organic and Nutritious Garden Alternatives (BONGA). In his preaching, he declared blessings to the RTC, management, staff, and all the partners who are supporting ATI-RTC 1. Moreover, Dr. Rogelio C. Evangelista, ATI-RTC 1 Center Director, expressed his gratitude and appreciation to all partners and stakeholders for their support which made ATI-RTC 1 achieve an excellent delivery of extension services. From his messages, he wanted to ensure continued support and commitment of the partners in backing-up ATI-RTC 1 in achieving a prosperous community or Region 1. This can only be possible with unity and harmony. The awarding was made more extraordinary through the expression of love and gratitude to ATI-RTC 1 by Ms. Lea Astrud T. Santiago and Mr. Angel D. Padron, 1 SIKAT President and 1 SIKAT Member, respectively. They both recalled how they were transformed with the interventions of ATI into their lives. Ms. Santiago was a former politician and knew nothing about farming but she is now an advocate and a farmer-leader that promotes agri-tourism in the Region. She expressed her faith that through ATI, she and 1 SIKAT believed that they are a group of world-class farmers. Meanwhile, Mr. Padron supposed that he was nobody in the community for he was only a high school graduate. But with ATI, he became a teacher of teachers to rural families and farmers. He was hoping for a longer life so he can be with ATI in reaching and helping rural families build their dreams. The SIKAP Awards was facilitated by the Partnership and Accreditation Services Section (PASS) through the leadership of Mr. Bienvenido T. Masbang. The selection and awarding was based on guidelines and criteria. Great things happened within the two-day event, which certainly made everyone learn and gain a ton. It seemed that many could not wait for the next year’s celebration.